The eternal search for a mattress that doesn't sag in the middle continues unabated. The problem is that no matter how much money you spend on various high dollar models, the unavoidable reality is it will eventually lose firmness. That is simply the nature of the beast. Mattress manufacturers have yet to invent a sleeping surface that doesn't become compacted, crushed and degraded over time beneath the weight of a sleeping body. The best you can hope for is to find a mattress that holds firm in the middle as long as possible. Even the most expensive mattress will eventually sag in the middle. A good mattress will provide about 10 years of ability to resist sagging. What begins life in your bedroom as a heavenly sleeping surface gradually wears out over time. Manufacturer claims of 15 to 20 years of life to support higher price tags are probably unrealistic, though a mattress is one furnishing where a higher purchase price tends to equate with a longer resistance to sagging. Still, your decision shouldn't be driven by cost alone. Though inner-spring mattresses claim 80 percent of the market, there are a variety of other types from which to choose, one of which might stand up better to sagging. At the heart of a spring mattress's design are dozens of steel coils which become compacted over time, allowing the middle to sag. This tendency can be somewhat delayed by choosing one with a well-padded material top that offers additional support. Flipping or turning the mattress every few months is one way to prolong the onset of sagging. A different type of mattress material, such as foam, might yield less sag in the middle. 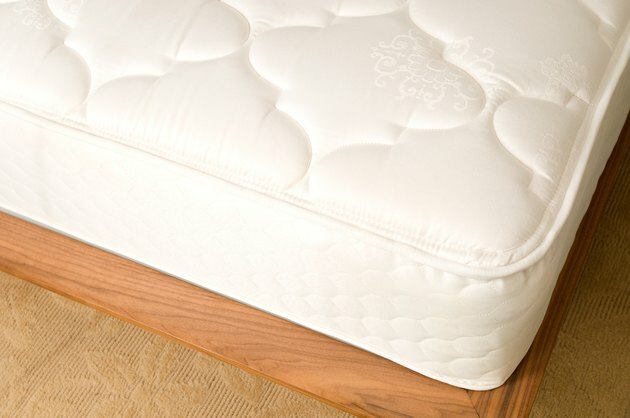 While even the firmest foam will become degraded and softer over time, you might find that it stands up better than a traditional inner spring mattress for your use. In general, the denser a foam, the more resistant to sagging it will be, though this resistance doesn't come cheap. A Swedish Temper-Pedic mattress, which retails for about $2,000, enjoys a reputation as the best option in foam, and should provide a decade of comfortable sleeping. For a mattress that absolutely does not sag in the middle, your best bet might be an air or water mattress, both of which have been the target of design innovations over the years. These days, an air mattress is not simply a camping accessory. Air and water mattresses are more at risk for leaking than in sagging. Theoretically, if you detect a sag in it, simply add more water or air to eliminate it. Though it will eventually develop a leak of some sort that necessitates replacement or repair, until that day, all it takes to remove a sag is to fill it up.